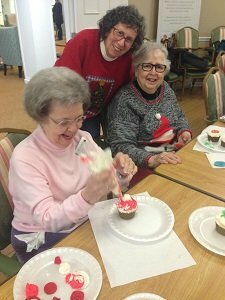 SMILE stands for Senior Multi-Interest Lifetime Enrichment . 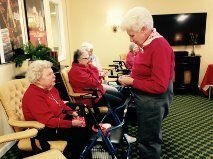 It’s goal is to increase our interaction with the senior citizens of our community for our mutual education and enrichment. There is much we can do to help them and much we can learn from them. 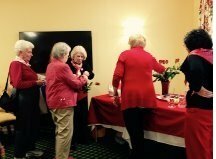 A festive Valentine’s Day tea was given for the Abbottswood Knitters in appreciation for all the scarves they have knitted for Operation School Bell®. 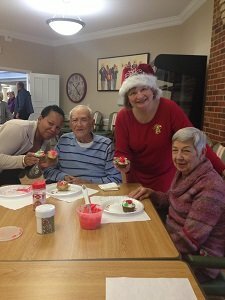 Members prepared a lovely table filled delicious treats. 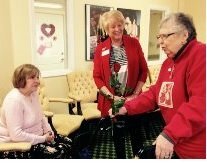 After sharing a fun filled hour of conversation, each Abbottswood knitter left with a red rose, a bag of Valentine cookies and a beautiful hand made Valentine. The Assistance League members left with two huge boxes of scarves for Operation School Bell. 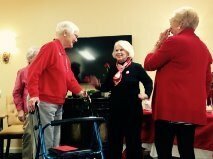 It was a lovely way to spend a Valentine’s Day afternoon!